Thrifty provide car and van rental, as well as prestige and luxury car hire, for both personal and business use. You can gain access to Thrifty’s vehicle hire service in various downtown locations throughout Glasgow and London, as well as many airport locations including Edinburgh Airport, Gatwick Airport, Heathrow Airport, Stansted Airport and Manchester Airport. You can choose from a wide selection of vehicles at Thrifty including manual cars, automatic cars, prestige and luxury cars, estate cars, 4x4s, elite cars, people carriers and vans, so whether you’re looking for vehicles for the whole family, for single person road trips, or for business purposes you can find the appropriate vehicles, for hire, at Thrifty. If you’re looking for vehicle hire specifically for business purposes, you can find it at Thrifty. Thrifty can provide short, mid and long term car hire, depending on your business objectives, they also deliver a cost-effective solution that can be used to support business critical requirements. Choose from one of the largest rental fleets in the UK for cars and commercial vehicles in all sizes, ideal for everything from transporting business goods to small business trips for one or two employees. Create a business account today and use the business calculator to determine how much your vehicle hire will be. In the prestige/luxury section at Thrifty, you can find all kinds of quality vehicles from top names in the industry. These vehicles include various BMW models, Jaguars, Land Rovers and Range Rovers as well as convertible cars, estates and coupes, all from luxury car companies around the world. All these prestigious vehicles are available for short, mid and long term hire in various areas around the UK like London and Glasgow, as well as a selection of airports like Manchester, Edinburgh and Stansted. 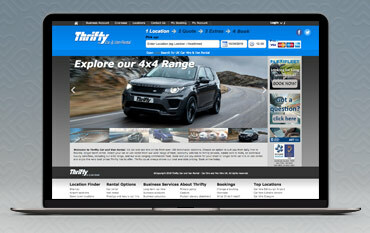 Thrifty provides car and van rental throughout the UK, both online and from over 100 nationwide locations. Choose from either daily or flexible long-term vehicle hire and book online with a discount code from us to save money on your car or van. Select your vehicle from a huge fleet that includes economy vehicles, family saloons, estate cars, 4x4s, luxury vehicles, an elite collection and a wide-ranging commercial fleet. All of the car and vans available for hire through Thrifty are extremely high quality and always clean and affordable. Book your vehicle hire for various locations around the UK including an extensive selection of airports. We are constantly on the hunt for Promotional Codes for Thrifty Car & Van Rental to help you with your money saving. Our experts check dozens of sites for secret codes including NHS discounts, student sites & social media channels saving you time & money!